For many women with PCOS, conceiving is only the first hurdle. These women face particular challenges, but RDs can help them achieve healthy pregnancies by addressing their special emotional, health, and dietary needs. Pregnancy can be an exciting time for women with PCOS, especially because so many of them may have been trying to conceive for years, with or without fertility treatments. In addition, being pregnant is a sign of femininity, and it may be a relief to some women who have felt masculine due to their “male” shape and symptoms such as excess hair growth and balding. However, having PCOS and being pregnant does pose some concerns. Some women who have undergone fertility treatments may carry multiple babies and will have special dietary and medical needs. 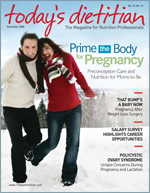 Also, because many women with PCOS have hormonal imbalances and are overweight or obese, they are at higher risk for miscarriage and complications such as gestational diabetes mellitus and hypertensive disorders during pregnancy.2-6 Proper medical management and medical nutrition therapy are imperative to prevent the onset of these complications and optimize fetal growth and development. Many women with PCOS who are able to conceive may have misconceptions about eating healthfully during pregnancy. Popular diet guidelines for PCOS (mostly from the Internet) recommend a very low-carbohydrate diet, but current evidence does not support it. Women who follow these recommendations may feel apprehensive about eating foods containing carbohydrates during pregnancy, including fruits, vegetables, legumes, and grains—all of which provide important vitamins, minerals, and fiber and are essential for fetal growth and development. Women may also be inclined to limit carbohydrates out of fear of gaining too much weight or to prevent gestational diabetes mellitus. (Currently, no evidence supports limiting carbohydrates during pregnancy to prevent gestational diabetes mellitus.) Dietitians should screen patients with PCOS for negative attitudes toward food and weight and convey the importance of consuming whole grain and whole food carbohydrates in sufficient amounts. On the other hand, some women may think pregnancy gives them license to eat anything they want. For the first time, they may feel less pressure to restrict their intake in a society preoccupied with thinness. If these women were very restrictive with their diet prior to conceiving, this could lead to binging during pregnancy, resulting in excessive weight gain. Additionally, women who already struggle with anxiety and depression may feel that these conditions are exacerbated during pregnancy and may turn to food for emotional support. A study published in the Journal of the American Dietetic Association in 2005 found that pregnant women who reported high stress, anxiety, and fatigue consumed more carbohydrates, fats, and protein and less vitamin C and folate. It is common for a woman who followed a prepregnancy limited-carbohydrate diet to abandon this way of eating while pregnant, turning to once-forbidden refined carbohydrates and high saturated fat-containing foods. As one patient put it, “I am pregnant now and do not have to worry about managing my insulin levels or my weight.” Such an attitude can lead to excessive weight gain during pregnancy, increasing the chances of adverse health risks such as gestational diabetes mellitus. Body image issues can also be of concern during pregnancy, as those who have struggled with their weight most of their lives may fear that their weight will spiral out of control. They may also have difficulty accepting weight gain and growing larger in general. Women with PCOS also carry their weight in their midsection and may not appear pregnant until their third trimester, causing some to struggle with body image concerns of failing to look pregnant. After gaining a reasonable 7 pounds and while in her second trimester, one of my patients admitted wanting to eat extra food to purposely gain more weight because she wasn’t “showing” and wanted the attention she saw other pregnant women receiving. Because most women with PCOS have hormonal imbalances and are overweight or obese, they are at a higher risk for miscarriage and complications such as gestational diabetes mellitus, preeclampsia, macrosomia, and preterm labor during pregnancy.7-13 Research has also indicated that infants born to women with PCOS have higher rates of admission to neonatal intensive care units.14 Many physicians with whom I have worked recommend initiating an oral glucose tolerance test sooner in women with PCOS. They recommend testing at 20 weeks gestation to screen for gestational diabetes mellitus and, if normal, repeat it by the standard screening time for all pregnant women between 24 and 28 weeks gestation. Proper medical management and medical nutrition therapy are imperative to prevent the onset of medical complications and optimize fetal growth and development. Postmeal physical activity, such as walking for 10 to 20 minutes, can help manage blood pressure and insulin resistance by controlling postprandial hyperglycemia. For women with PCOS, pregnancy should be considered a state of pre-gestational diabetes mellitus and as a precaution, diet guidelines should reflect those for gestational diabetes mellitus. A slight reduction in carbohydrate intake of 35% to 40% of total calories is therefore suggested and consistent with the American Diabetes Association guidelines for gestational diabetes mellitus. The majority of carbohydrates should be of whole grain and high-fiber quality, with at least 28 grams each day (the dietary reference intake requirement) for optimal glucose and insulin control. Dietetics professionals must convey the importance of distributing carbohydrates evenly throughout the day and encouraging three meals and two to four snacks, as well as an evening snack to manage glucose levels throughout the night. All meals and snacks must include protein-rich foods to help stabilize glucose levels. Due to the high rate of miscarriage and gestational diabetes mellitus related to elevated insulin levels, women with PCOS should limit or avoid simple carbohydrates, including sweetened beverages (eg, juices, soft drinks, sports drinks), candies, and desserts. Do Women With PCOS Have More Difficulty Breast-Feeding? Because of the many hormonal imbalances associated with PCOS, researchers have speculated that some women may have difficulty breast-feeding and producing an adequate milk supply for their infants. The hormonal aberrations in PCOS involve insulin, progesterone, and estrogen, all of which are important to breast development and milk-secreting ability.16 Lisa Marasco, MA, IBCLC, is a lactation consultant who began studying the connection between PCOS and low milk supply after seeing two patients with PCOS in one day who had problems with milk production. In her thesis, she studied a group of 30 women with lactation failure and found that more than one half of them were obese, 57% had a history of infertility, and 67% experienced oligoamenorrhea or amenorrhea. According to Marasco, some women with PCOS may have more difficulty producing adequate milk because the breast tissue fails to undergo the normal physiological changes during pregnancy needed to prepare for lactation or perhaps because not enough breast tissue existed prior to pregnancy (hypoplasia). Women with PCOS have low levels of progesterone, which is needed for alveolar growth and breast tissue development. Insulin also plays a role in milk production, and having insulin resistance may contribute to lactation problems in women with PCOS, according to Marasco’s research. Milk supply problems may be prevented or ameliorated by establishing early intervention strategies during pregnancy. This may include obtaining resources for local breast-feeding support groups and preparing to work with a board-certified lactation consultant soon after giving birth. Good breast-feeding management, including proper latch and positioning, are imperative to successful milk production and proper infant growth and development. According to Marasco, all of these tactics will help establish the foundation to good milk supply, yet they do not address the underlying problems. Although not scientifically tested, goat’s rue, fennel, kale, verbena, chasteberry, and fenugreek are herbal supplements reputed to increase milk supply and possibly stimulate breast growth.18,19 Using progesterone supplements and metformin during pregnancy may also help support an adequate milk supply in women with PCOS and possibly support breast development during pregnancy. Marasco has tried metformin with “a number of PCOS moms with low supply and, in some cases, metformin alone increases milk production.” However, she adds, “Metformin is not going to help much if the woman does not have enough breast tissue in place to begin with.” Medications such as metoclopramide can also be prescribed to boost milk supply. Interestingly, while some women with PCOS experience low milk supply, others report an overabundance of milk production. Evidently, this area needs more research. Is Metformin Safe to Use While Breast-Feeding? Since many women choose to take metformin during pregnancy for the benefits discussed previously, they may be inclined to continue taking metformin while they breast-feed to prevent a “rebounding” of PCOS symptoms after birth, control insulin levels, and possibly help produce an adequate milk supply. However, the use of metformin during lactation is controversial. The joyous time of pregnancy can pose additional concerns to women with PCOS, as they are at a higher risk for miscarriage and obstetrical complications such as gestational diabetes mellitus, preterm labor, pregnancy-induced hypertension, and macrosomia. Some women may be resistant to eating carbohydrate foods while others may consume too many of them, posing additional risks to mother and fetus. Dietitians must educate patients about the benefits of a good diet and lifestyle to sustain a healthy pregnancy. In general, PCOS in pregnancy should be considered a state of pre-gestational diabetes mellitus and dietary guidelines should resemble those for gestational diabetes mellitus. In addition, some women with PCOS may have difficulty breast-feeding and producing an adequate milk supply for their infants due to hormonal imbalances. Dietitians can play an integral part in the health of women with PCOS during pregnancy and throughout the lactation period. — Angela Grassi, MS, RD, LDN, is the author of The Dietitian’s Guide to Polycystic Ovary Syndrome and The PCOS Workbook: Your Guide to Complete Physical and Emotional Health. 1. Azziz R, Woods KS, Reyna R, et al. The prevalence and features of the polycystic ovary syndrome in unselected population. J Clin Endocrinol Metab. 2004;89(6):2745-2749. 2. Seale FG, IV, Robinson RD, Neal GS. Association of metformin and pregnany in the polycystic ovary syndrome. A report of three cases. J Reprod Med. 2000;45(6):507-510. 3. Barbieri RL. Metformin for the treatment of polycystic ovary syndrome. Obstet Gynedcol. 2003;101(4):785-793. 4. Thadhani R, Stampfer MJ, Hunter DJ, et al. High body mass index and hypercholesterolemia: Risk of hypertensive disorders of pregnancy. Obstet Gynecol.1999;94(4):543-550. 5. Sarwer DB, Allison KC, Gibbons LM, Markowitz JT, Nelson DB. Pregnancy and obesity: A review and agenda for future research. J Womens Health (Larchmt). 2006;15(6):720-733. 6. Siega-Riz AM, Siega-Riz, AM, Laraia B. The implications of maternal overweight and obesity on the course of pregnancy and birth outcomes. Matern Child Health J. 2006;10(5 Suppl):S153-S156. 7. Solomon CG, Willett WC, Carey VJ, et al. A prospective study of pregravid determinants of gestational diabetes mellitus. JAMA. 1997;278(13):1078-1083. 8. Anderson JL, Waller DK, Canfield MA, et al. Maternal obesity, gestational diabetes, and central nervous system birth defects. Epidemiology. 2005;16(1):87-92. 9. Vahratian A, Siega-Riz AM, Savitz DA, Zhang J. Maternal pre-pregnancy overweight and obesity and the risk of primary cesarean delivery in nulliparous women. Ann Epidemiol. 2005;15(7):467-474. 10. Cnattingius S, Bergström R, Lipworth L, Kramer MS. Prepregnancy weight and the risk of adverse pregnancy outcomes. N Engl J Med. 1998;338(3):147-152. 11. Rosenberg TJ, Garbers S, Chavkin W, Chiasson MA. Prepregnancy weight and adverse perinatal outcomes in an ethnically diverse population. Obstet Gynecol. 2003;102:1022-1027. 12. Vahratian A, Zhang J, Troendle JF, Savitz DA, Siega-Riz AM. Maternal pre-pregnancy overweight and obesity and the pattern of labor progression in term nulliparous women. Obstet Gynecol. 2004;104(5 Pt 1):943-951. 13. Larsen CE, Serdula MK, Sullivan KM. Macrosomia: Influence of maternal overweight among a low-income population. Am J Obstet Gynecol. 1990;162(2):490-494. 14. Boomsma CM, Eijkemans MJ, Hughes EG, et al. A meta-analysis of pregnancy outcomes in women with polycystic ovary syndrome. Hum Reprod Update. 2006;12(6):673-683. 15. Glueck C, Goldenberg N, Pranikoff J, et al. Height, weight, and motor-social development during the first 18 months of life in 126 infants born to 109 mothers with polycystic ovary syndrome who conceived on and continued metformin through pregnancy. Hum Reprod. 2004;19(6):1323-1330. 16. Marasco L, Marmet C, Shell E. Polycystic ovary syndrome: A connection to insufficient milk supply? J Hum Lact. 2000;16(2):143-148. 17. Waldoks DA. PCOS: Breastfeeding case study. Women’s Health Report. Summer 2008. 18. Foote J, Rengers B. Maternal use of herbal supplements. Nutrition in Complementary Care. 2000;1. 19. Cartwright M. Herbal use during pregnancy and lactation: A need for caution. The Digest. 2001;(Summer):1-3. American Dietetic Association Public Health/Community Nutrition Practice Group. 20. Briggs GG, Ambrose PJ, Nageotte MP, Padilla G, Wan S. Excretion of metformin into breast milk and the effect on nursing infants. Obstet Gynecol. 2005;105(6):1437-1441. 21. Hale TW, Kristensen JH, Hackett LP, Kohan R, Ilett KF. Transfer of metformin into human milk. Diabetologia. 2002;45(11):1509-1514. 22. Gardiner SJ, Kirkpatrick CM, Begg EJ, et al. Transfer of metformin into human milk. Clin Pharmacol Ther. 2003;73(1):71-77. 23. Glueck CJ, Salehi M, Sieve L, Wang P. Growth, motor, and social development in breast-and formula-fed infants of metformin-treated women with polycystic ovary syndrome. J Pediatr. 2006;148(5):628-632.